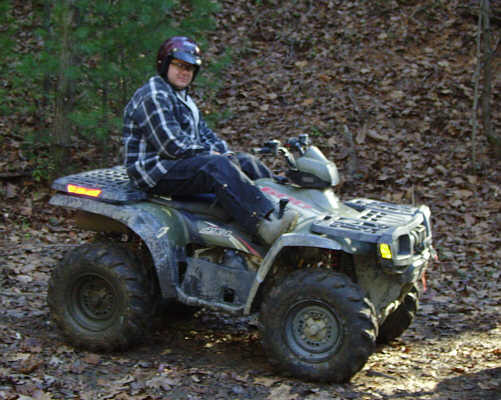 Three vehicles went, the Bronconator, Andy's Polaris ATV and BJ from the Wabash Valley 4 Wheelers Club in his Jeep Cherokee. Guess what? Just after hitting the first trail of the day the Bronconator got stuck in a mud hole. After Dave tried to get the vehicle out there was a quite a noise coming from the front and the puddle began to show signs of quite a lot of oil. Getting it dragged out we had a look underneath. Something had broken in the front diff and gone straight through the casing leaving a hole about a centimetre across. Oops! For the rest of the day we spent in four wheel drive with a horrible racket coming from the front diff or trying to get around in two wheel drive. Needless to say, it was another good day, the Bronconator was either screaming or sliding around or getting stuck in every hole we came to. 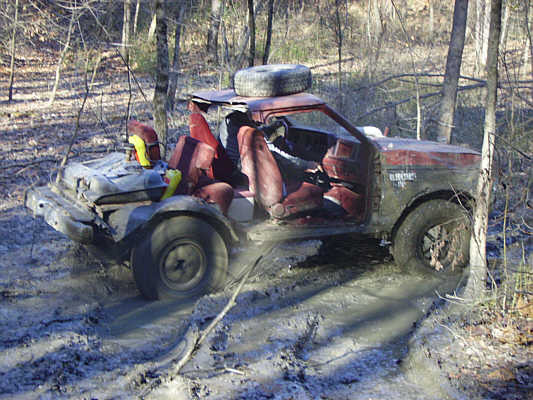 Sometimes it just screamed, then slid into a mud-hole. 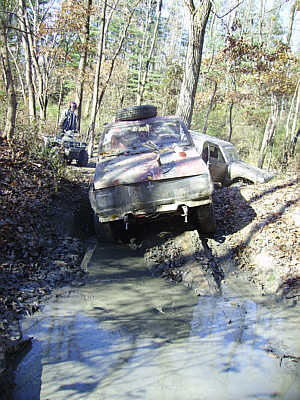 Normally it would fly through stuff like this but not in two wheel drive! The poor old Bronconator also suffered some more body modifications, mostly because, in two wheel drive, it more or less went where it wanted. One side of the bumper got ripped off by a tree, a little while later the other side suffered the same fate. The centre section got ripped off while it was being towed out of yet another hole. The weight of the tyre also had an unexpected effect of the roof. Dave and I started off with a couple of inches of headroom, by the end of the day we had to either sit very low in the seats or hang our heads out of the side of the vehicle. There were two pretty major collisions with trees. One we sort of slid sideways into and the other was just a straight head-on. Dave says he was trying to steer us away from it, but I think he just wanted another nice new dent in the front. This is how we spent quite a lot of the day - being dragged out of muddy holes. We're not sure what is going to happen to the Bronconator. 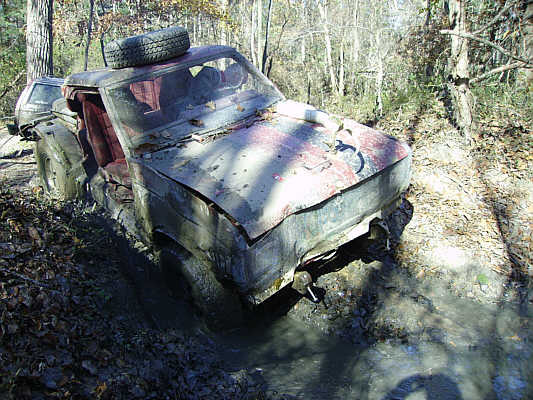 There appears to be three choices, scrap it, rebuilt the front end with a solid axle or replace the front end with something from a scrapyard. We think we'll try the third of these. A solid axle may be too expensive but the Bronconator has just been to much fun to scrap just yet.